Imagining a Different Future - What barriers prevent us from achieving climate justice? Climate change science, policy making and communication are about to come into sharp focus in Australia with hundreds of international and Australian climate and ocean scientists meeting at the AMOS-ICSMO 2018 Conference in Sydney (5-9 February) and the focus on science at the Imagining a Different Future Conference in Hobart (8-10 February). It’s a great time to ask what the latest science is telling us about the threat of climate change, what are the challenges for scientists, and why does it seem so hard to get any real action? We will be following the discussions in Sydney closely and having our own lively conversations in Hobart! 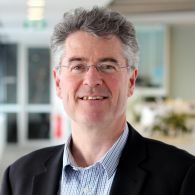 Nathan Bindoff is Professor of Physical Oceanography at the University of Tasmania in the Institute of Marine and Antarctic Studies (IMAS) and Antarctic Climate & Ecosystems Cooperative Research Centre. Professor Bindoff specialises in ocean climate and the earth’s climate system, with a focus on understanding the causes of change in the oceans. He was the coordinating lead author for the ocean chapter in the Inter-Governmental Panel on Climate Change Fourth Assessment Report and Fifth Assessment reports. Professor Bindoff and colleagues documented some of the first evidence for changes in the oceans in the Indian, North Pacific, South Pacific and Southern Ocean’s and the first evidence of changes in the Earths hydrological cycle from ocean salinity. His most recent work is on documenting the decline in oxygen content of the oceans and dynamics of the Southern Ocean. The Australian Meteorological and Oceanographic Society and the American Meteorological Society meet at the Joint 25th AMOS National Conference and 12th International Conference for Southern Hemisphere Meteorology and Oceanography, AMOS-ICSHMO 2018, at UNSW Sydney from 5 to 9 February 2018.